Good news for Brook House? A new development in the long running saga of Brook House in Tiptree, Essex has opened the possibility for some good news. As had been reported here before, the lovely red-brick house in the heart of Tiptree was subject to an application to demolish from the owner who claimed that it was beyond repair. However, photos taken recently show that the house is actually in very good condition and pressure from heritage organisations such as SAVE Britain’s Heritage have led to a spotlight being shone on the plans. It’s now been reported that the application has been withdrawn. It’s the slow, piecemeal loss of fine houses such as this over the last fifty years which has left our towns all the poorer visually. Hopefully there will now be discussions where the starting premise is that the house should be restored as an important part of Tiptree’s architectural heritage. 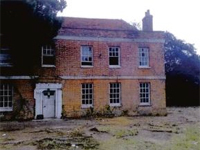 This entry was posted in News and tagged architecture, At Risk, brook house, buildings at risk, country house, english heritage, essex, heritage, listed, restoration. Bookmark the permalink.